Do amber collars repel fleas? Are retractable dog leashes dangerous? Make your dog a champion! Getting to know a new dog is like going on your first blind date after the end of a long relationship. You vividly remember the high points of the relationship just ended — and totally forget all those awkward getting-to-know-you moments at the beginning. For me with Spike, those early days mixed grief for my late dog Joey with misgivings about my readiness for a new dog — and uncertainty whether Spike was the right dog for me. Joey was an elegant, fine-boned, long-legged, Cary Grant-like terrier mix. 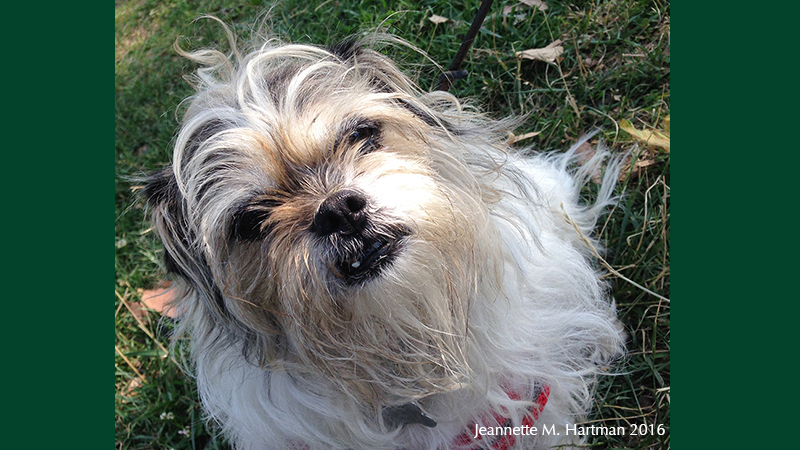 Spike is a stout, short-legged, Shi Tzu-terrier mix. (Think Danny DeVito sedated.) His eccentric coat has patches of short black and brown fur mingled with long, flowing coarse white hair. Joey was aloof and reserved. He had a terrier’s prey drive, loved treats and learned quickly how to earn them. Spike is placid. He readily comes to people for petting. Cats, squirrels and toys that roll do not interest him. Treats don’t appeal much. Spike doesn’t know any basic commands and is much lower energy than Joey. I purposely picked a new dog that was different than Joey, hoping that it would help me see the new dog on his own merits instead of standing in Joey’s shadow. But the differences only highlighted that Joey was one-of-a-kind — and now gone forever. As the weeks have unfolded, I’m discovering that Spike also is one-of-a-kind. I’m becoming enchanted with his round, old soul brown eyes. His excitement about going out for a long morning walk is contagious. I love brushing his piebald fur in the morning after his breakfast: checking for burrs, arranging the star of silky white fur on his round forehead and admiring the circle of short brown fur shading into black on his right side. I’ve given him the collar I won in a raffle from L.A. Saddlery. It was custom-made for Joey who never wore it. (It required a harness to attach a leash to. Joey hated putting on a harness. Spike, who has always worn a harness and has no problem having his legs handled, wears the new collar well. Spike is changing, too. He’s no longer the politely confused dog of the first couple of days, wondering what he’s doing in my house. He’s starting to anticipate my household routines. He’s eating a little better as I discover his tastes. There’s even been a little interest in treats. We’re signed up for obedience classes in mid-July. We’re starting to enjoy the process of going steady again. Wecome to LA's dog blog Fidouniverse.com. FidoUniverse is also the best LA dog directory. Whether you are a dog owner who needs to rate a service for free or a business that offers dog services, the Los Angeles pet directory is sure to help. Get all of Fido's blog posts delivered directly to your email inbox! Enter your email address below.